Recent reports claim that Google will team up with HTC to launch the next-generation Nexus 10 tablet and the slate will arrive as soon as this summer. HTC is far from its glory days as the company's stock value and the public's faith have been dropping, while performance of devices like the Jetstream tablet has been disappointing. Now it seems there may be hope for HTC, since recent reports claim they will team up with Google to deliver the next-gen Nexus 10 Android tablet. According to an article published on Digitimes by Monica Chen, HTC already missed a chance granted by Google back in 2012, when it refused to work on the Nexus 7. The company that took advantage of the offer was ASUSTeK Computer Inc. and the resulting 7-inch Android slate turned out as a successful device. Google released the original Nexus 10 together with Samsung back in late 2012, but they failed to ramp up shipments as needed. The second generation is expected to feature a WQXGA 10-inch display, 3 GB of memory, as well as 5 MP back and 3 MP front cameras. 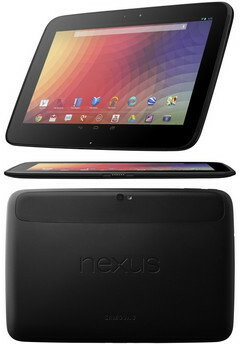 It is also rumored that this new Nexus 10 will run Android 4.5 and will be available with 16 GB or 32 GB of internal storage. Next to the Nexus 10, Google may also release an 8-inch Nexus tablet by mid-2014. Even if both rumors become reality and HTC is chosen to manufacture both the "Nexus 8" and the second-generation Nexus 10, industry analysts believe they may face the same problem as Samsung and will not be able to deliver as many units as needed.